Do you feel like something is missing in your life? Is it that wave of joy that sweeps over you when you hear a great pop song? 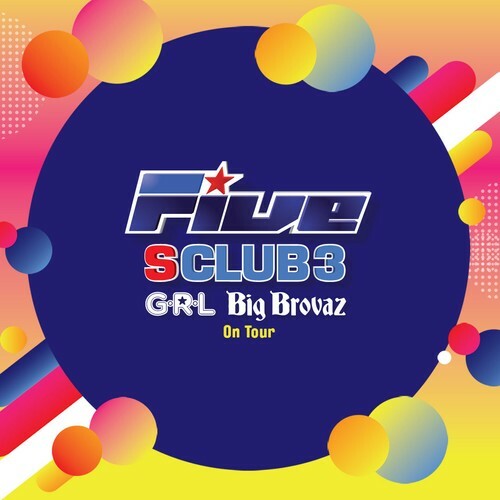 Well, you are in luck because Five + S Club 3 + Big Brovaz + G.R.L. bring the fun time party vibes to Australia, with their 2019 Poptastic Tour! The 90’s were the decade of boybands. One of the biggest boybands and for many their absolute favourites, were the hit machine’s known as Five (or 5ive). They changed the way we looked at boybands—they didn’t wear matching outfits or mime or sit on stools. They released a series of great pop songs—'Keep On Movin, 'If Ya Getting Down', 'Everybody Get Up', 'When the Lights Go Out', 'Got The Feelin', 'We will Rock You', 'Slam Dunk' to name a few. S Club 3 (Jo, Tina and Brad) deliver the party as only they can, performing all their biggest sing-a-long hits including ‘Bring It All Back’, ‘Don't Stop Movin’, ‘Reach’, ‘Two in a Million’, ‘Never Had a Dream Come True’ and of course ‘S Club Party' guaranteed to make you smile! Big Brovaz join Five and S Club 3 for this massive event! Big Brovaz had one of the biggest selling singles in Australia in 2002 with ‘Nu Flow’, following it up with ‘Favourite Things’ and ‘Baby Boy’! But wait, there’s more, G.R.L. had a mega world wide hit on their hands with 'Ugly Heart' which sold over 300,000 copies in Australia. Plus the one and only Levins joins this ultimate party, as your DJ and host for the night!